hr Daily, 3 times weekly, totaling 12 times in a month. cost of tutoring her for a month / 4 weeks. Hmmmm, which is it him or her? And two first names...okay I'll play along. Looks like a form letter to me...JFSAG what will they say if I ask for cash? When he comes have him bring cash. Same form letter not even any customizations or ad libs...amateur scammer. Not even any fun to play with. I often tell my students that math is about critical thinking not computation. This bemuses some and amuses others. The idea is not to just learn computation and memorize formulas but to learn how to apply this knowledge to solve problems. The universal language we use to solve problems via science or engineering is math. The very concept that math is a language is lost on most, which is why we don't teach math like a language. If we taught English the way we teach math nobody would speak English. Computation just helps us "do the math" or get the answers required to solve problems. Somehow this seems to have been lost in translation by those who have tried to set up a system for teaching the mathematics. It becomes obvious that system doesn't work very well. The focus is on computation, but not on how to use it. Just because you are good at computation does not mean you are good at math. Many students have found this out the hard way. You have to be able to apply it. Any teacher who has taught math has heard the question "Why do we have to learn this stuff?" or "When are we ever going to use this stuff?" especially if the subject is algebra. My answer would be because it teaches you how to think critically. Critical thinking is helpful in all areas of life. Except we don't teach it that way. We have gotten lost in computation. Quotes like "The human mind has never invented a labor-saving machine equal to algebra." and "Calculus is the most powerful weapon of thought yet devised by the wit of man." make no sense to the average student because math at some point stops making sense and becomes meaningless. Students memorize formulae long enough to spit it out for a test and then forget it. Algebra and calculus are the most failed subjects in the USA, and yet these are the very subjects students need to understand in order to become powerful problem solvers. In the past all the greatest philosophers were also great mathematicians: Plato, Aristotle, Socrates, Confucius even Einstein, but all the great philosophers of antiquity were also great mathematicians because the mathematics is used for critical thinking. This is also why Universities still require "higher math" for degrees in Law or Medicine where I often hear students wonder aloud what the point of taking math they'll never use is. They miss the point that it's not the math and computation but the critical thinking that will make lawyers better at debate and doctors better at problem solving in their field. The mathematics has evolved to solve problems. The history of math is the history of men using numbers for problem solving. Students can not use their computational skills (if they have them) to solve story problems. Two stage problems where students have to find one answer before they can solve another are missed by the vast majority. With concept based teaching, understanding the concepts makes math easier and even fun because once you understand the concepts you know what to do and the computation simply helps you do it. Once the concept is understood any question just becomes a variation on a theme and the computation is easy to apply. 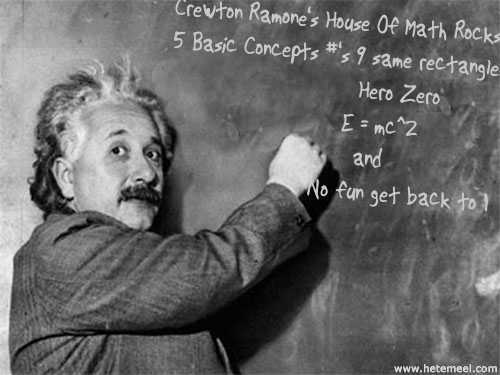 Crewton Ramone is the alter ego of an irreverent math tutor. For a full bio Google him. Math really can be fun and easy. Another 15 min synopsis of of a 2 hour session, replete with commercial for CRHOM at the end. An earlier session with these same students. Here is a Blogpost with pics and words no screencasts or video showing the concepts presented above. These video shorts explain why it is I am underwhelmed with teachers who tell me they can't start algebra early on...less so with teaching methodologies that tell you NOT to teach math, (which is a language) early on because the students "aren't ready for it" thus reflecting the teacher's fear of math onto the students...in some cases these teachers have gone on to found methods that damage entire generations of children's mathematical abilities. Learn how to use your base ten manipulaives. Then of course there are the text book writers who seem to start with the premise that math is hard and certainly not fun. I've had parents (and Catholic Nuns) tell me that "math should be work"...it doesn't have to be. Using manipulatives or base ten blocks makes math easy and fun. As you can see they learn math concepts quickly and easily. Check out this post showing these same boys doing 3rd power math in their heads without any manipulatives. It should be clear that using base ten blocks avoids future problems it doesn't cause block dependence...they see the blocks in their heads. It's child's play because they can see it. The manipulatives allow them not only to see the math but to get their hands on it. 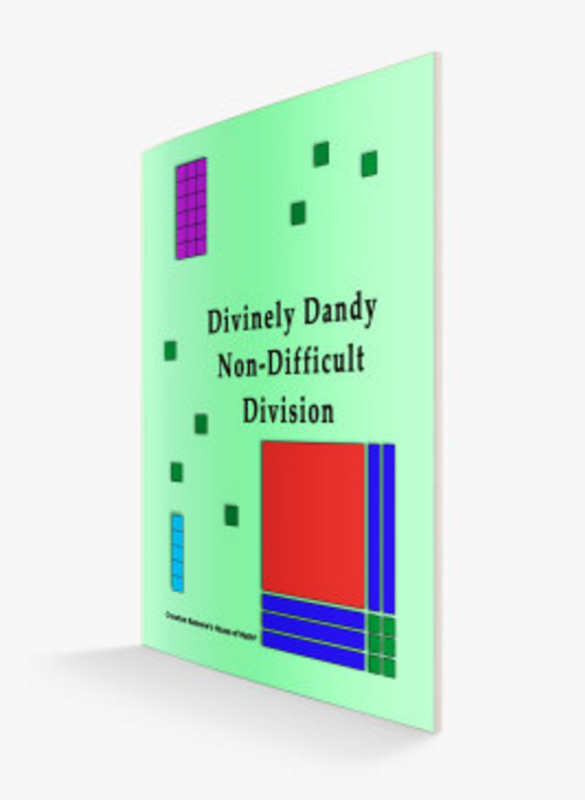 Couple this with the compound teaching algebra does for you and math concepts and facts are mastered in much less time with much less pain and difficulty. 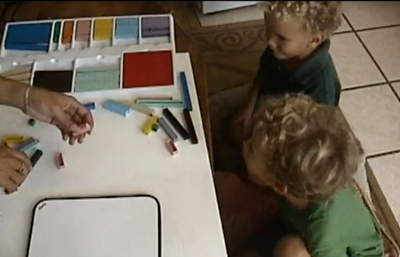 YOU can learn how to teach your kids using this method. I don't care who you are or what your experience is with math. You can give your kids a head start and open the gateway to all manner of opportunities while at the same time preserving their self esteem. You can also give them a positive mindset toward math. If they think math is fun and easy it will be. Crewton Ramone: Negative Three Distributes w/ a 4 & 5 yr old. Crewton Ramone Intro To Negative Numbers. Crewton Ramone Does Algebra With 4 and 5 Year Olds. (ScreenCast). Go to the ALGEBRA page at Crewton Ramone's House of Math where you can learn quite a bit of algebra for a few bucks (cost of a password)...most of it's FREE as you can see. If I can explain algebra so that 5 year olds can do it, I bet I can explain it to you. Get set of blocks and get started. Previously you had to attend trainings or seminars to learn how to use these powerful tools but the internet has changed everything. You can now learn the basics for FREE and you can learn the more "advanced" concepts for just a few bucks. Get started NOW. Here is the 4 year old working by himself...four year old math enrichment. ⇐ Click that and prepare to be amazed. Just because he can't write doesn't mean he can't learn math concepts. In the same way we don't wait for them to be able to write before teaching them their mother tongue in this case English. This post is a couple of years old. You should see the math these boys are doing now, often without blocks and no paper or pencil either. Poke around on this blog and see for yourself. Introducing a 4 year old to algebra. Another 4 year get's some algebra. 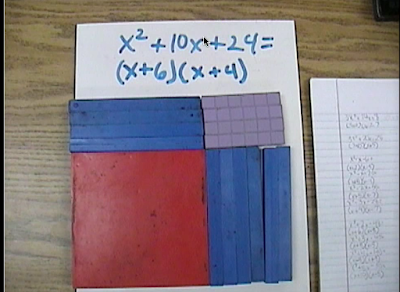 A classroom of 1st graders factoring polynomials. Get this book if you have children 7 and under...find out more about it, and a look inside here. You can get it without a password for just $2.99. 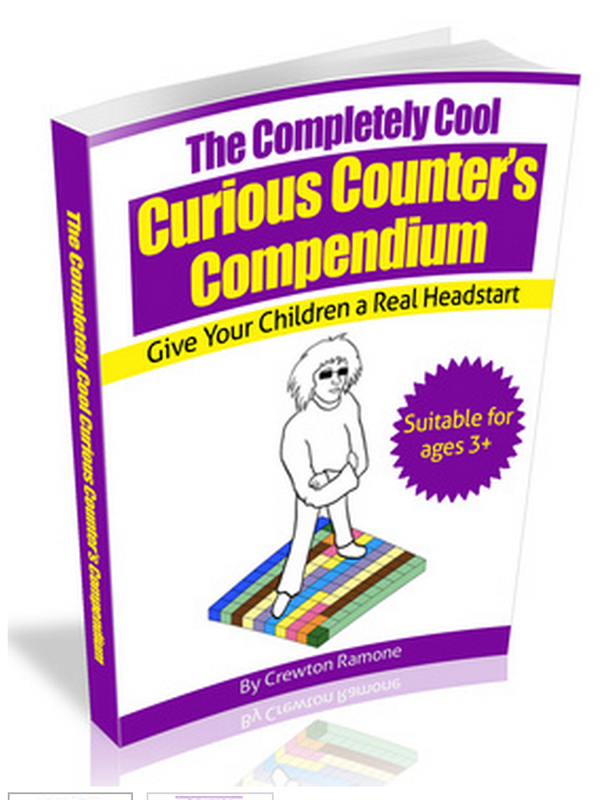 Give your kids a REAL head start with math and numbers with this book and my website. Here is a longer video showing multiplication, algebra and division. The lesson is simplified by keeping in mind the five basic concepts, and having blocks the child can get her hands on. In my travels I found that the saying math is not a spectator sport was QUITE TRUE. Just watching is not enough, you need to get your hands on the blocks. It was became apparent the difference between everybody in the room "getting it" and "only" getting 80 or 90% of the room was to make sure everybody had a set of blocks or were sharing a set of blocks, but everybody had to be able to have their hands on the blocks. If you don't "get it" you may be one of those people that needs to get your hands on the blocks. You also might want to subscribe to my youtube channel. Labels: Algebra, Base 10 Manipulatives, Compound Teaching, Manipulatives, Mortensen Math.